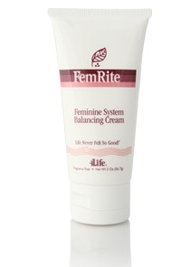 FemRite is a unique female balancing cremé that contains a rich blend of natural progesterone (from soy) and wild yam extract. FemRite helps your body reach optimum system balance and greater health and wellness. After applying FemRite cremé to the skin, it will absorb quickly and easily. FemRite’s topical delivery offers great flexibility by allowing you to use as much or as little cremé as your body needs to stay in balance. Use FemRite with BioGenistein Plus® for complete hormonal balance! FemRite’s topical delivery allows great flexibility by allowing you to use as much or as little creme as your body needs. It is formulated to absorb quickly through the skin into the fat layer under the skin and then into the bloodstream. Wild yam and soy extracts combine to provide a rich blend of natural progesterone that has a chemical structure identical to that of the hormone produced by a woman’s body. "Using FemRite has supported healthy menstrual cycles for the first time in 10 years."